Most, if not all of the time when you copy a piece of text from a website that has formatting such as bold, underline, hyperlink, italic, etc and paste it into Microsoft Word or your webmail such as Gmail/Outlook, you’ll notice that the formatting of the text has been retained. However, the text formatting from the source is not carried over when you paste it to Notepad and that is because Notepad is a simple text-only editor. Because of this, a simple workaround to remove formatting from the text is to paste the formatted text into Notepad and then transfer the unformatted text from Notepad to another target. If you frequently need to convert formatted to unformatted text, the Notepad workaround may not be the best solution as it involves double work. Here we have some different solutions to help you save your time and effort by reducing a step in the process. The first thing you should try before anything else is the common shortcut key that is used to paste unformatted text which is Ctrl+Shift+V. A lot of popular software such as Firefox, Chrome and OpenOffice already support this shortcut key. Do note that if you have the Adblock Plus extension installed in Firefox, pressing the Ctrl+Shift+V combo will open the “Blockable items” attachment. The simple solution is to enter about:config in the URL address bar, click “I’ll be careful, I promise” button. Type extensions.adblockplus.sidebar into the Search bar. Double click on the extensions.adblockplus.sidebar and change from “Accel Shift V, Accel Shift U” to “Accel Shift U“. You’ll need to restart Firefox for the changes to take effect. Firefox will now paste unformatted text with Ctrl+Shift+V and you can use Ctrl+Shift+U to open Adblock Plus’ blockable items attachment. If the software does not support the removal of formatting in the pasted text through Ctrl+Shift+V, you can try one of the software utilities below. 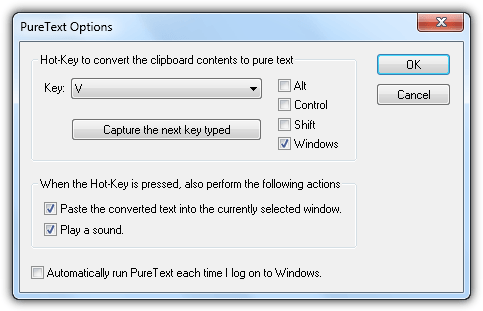 PureText is a free and simple application that is able to automatically remove rich formatting and paste unformatted text through the default hotkey WIN+V. PureText is a single portable executable file that weights only 29KB in size and takes up merely 1.5MB in memory when running in background. The hotkey can be changed from the options if you prefer to use a different hotkey other than WIN+V. You can also configure PureText to automatically run after logging in to Windows. PureText is available in both 32-bit and 64-bit versions and supports Windows 95-8. A really useful tool that fills the gap of third party software that does not support pasting of unformatted text. HovText has a slight advantage over PureText in terms of features. PureText allows you to use a special hotkey to paste unformatted text while HovText is able to do this as well via a hotkey, an additional feature is it can universally remove any text formatting from the clipboard once it is enabled. Another useful feature found in HovText is the ability to store up to 100 text snippets that have been previously copied to the clipboard. You’ll need to configure a hotkey for this feature to work in the Settings area. Do note that the latest version of HovText 3 was released 3 years ago and is still in Beta, we did experienced occasional program crashes while using it. You may want to consider using the older version for a more stable usage. If you need a tool that constantly converts any formatted text in the clipboard to unformatted text but HovText is unstable on your operating system, you can try Clipboard Format Cleaner. It is as simple as running the portable EXE file as a tray icon in the notification area and it will instantly start monitoring the clipboard for text and remove any detected formatting so that you can paste it as plain text. The only way to temporarily disable the program is by right clicking on the tray icon and selecting Disable. Unfortunately there is no hotkey support to easily disable or enable the function so it is best to use it for a long period. 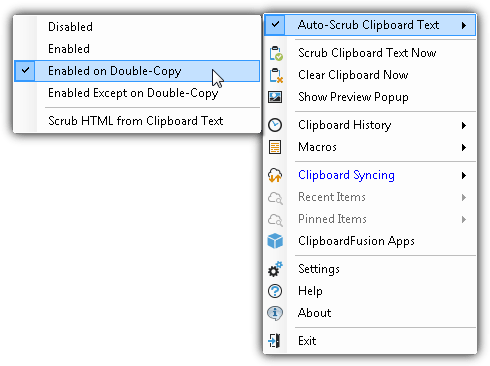 ClipboardFusion comes with 2 versions which is the Free and Pro (paid). The only difference between the 2 versions is that the clipboard synching functionality disabled in the Free edition. The ability to remove formatting from text is called Text Scrubbing and can be found on both versions. Upon running, the text scrubbing feature is enabled by default and will automatically scrub text on the clipboard. 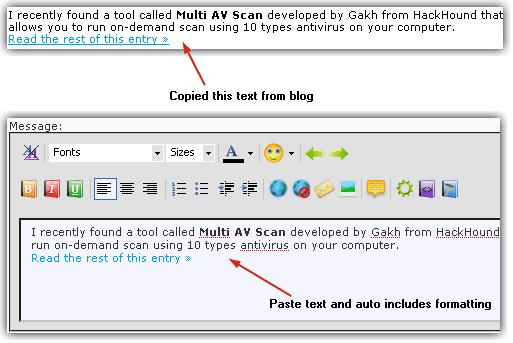 A unique feature that is not found on other software mentioned above is the ability to only scrub the text when the text is copied twice. ClipboardFusion can also remove line breaks, tabs, HTML tags, and white space from the beginning and end of the text in the clipboard. 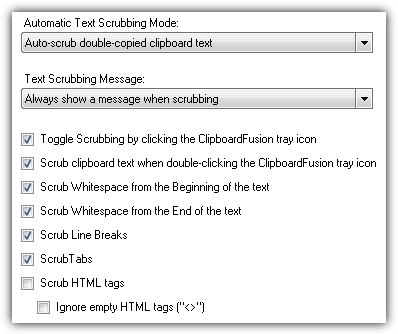 The text scrubbing options can be found in the program settings area. 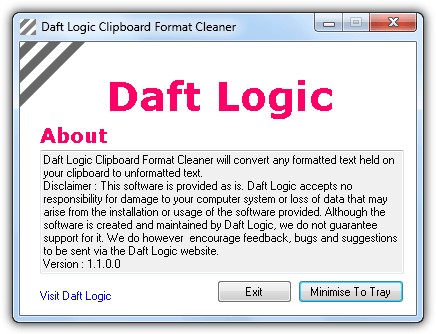 Other features such as replacing text strings when scrubbing, macros, hotkey configuration, ignoring specified programs from monitoring can also be found in ClipboardFusion. Additional Tip: For Microsoft Word 2013, you can actually configure the pasting behavior of either keeping source formatting, merge formatting or keep text only when pasting within the same document, between documents, and from other programs. The settings can be found in File > Options > Advanced > Cut, copy, and paste. This app is useful if you are IT person, to save time instead of open and close notepad hundreds time a month or even week. If you need that just occasionally, just use notepad. Thank you Raymond! This is just what I was looking for. Quite often I cut and past formatted text from my Word documents into rich-text Yahoo! Mail. The pasted text in the email editor appears with the destination formatting before I send it, which is what I want. But when I look at the content after it’s sent, the pasted text has the source formatting. My solution has been to cut and paste to notepad, then cut and paste to the email. Now I just cut and then paste using the V-Windows hotkey. Excellent finding. Thanks for sharing. For my job responsibility I have to copy lots of texts from multiple sources (eg. web pages) and then take it to notepad and then take it to word. But this solved my problem. Thank you very much for posting this!!! It can save precious time with a little effort. Thanks for this soft, copy-paste is frequent everyday and this program will help us to make it easier.